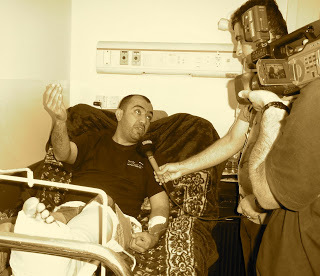 A Kurdish lawyer Karwan Kamal was shot at 11:20 pm, 26th June, 2011. One bullet went through his left foot and broke two bones. He was attacked by an unknown armed man at a parking lot. He said: "when I was paying the money, I suddenly felt pain in my leg. I fell and saw a man with traditional Kurdish clothes aiming at my head with a hand gun. I jumped over a low wall to protect myself." He said the armed man shot a total of five bullets and left in a private car close by. Karwan was an active participant in the 2 months demonstrations against the corruption of Kurdistan Regional Government (KRG), started in February and ended on 19th April because of the violent response from the government against the protesters. After the crack down on the demonstrations by the government, some leaders were arrested, abducted and beaten up, and followed. Karwan has been trying to collect those cases. Ten days ago, many involved in the protests heard there was a list of 200 leaders composed by the security force of protesters who were to be arrested or killed. It appears that Karwan is the first victim from that list. Karwan is in the hospital now. The surgery was done and he was able to receive visitors.